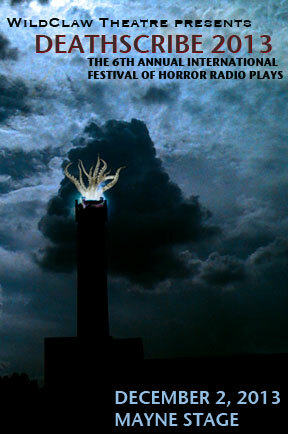 Every year since 2008 Wildclaw Theatre has celebrated the holiday season with a Festival of short horror radio plays. Running only 10 minutes in length, these plays have to depend strictly on story and sound to get their ideas across. I attended my first Deathscribe festival last year with Terror Dave Fuentes (read Dave’s review of it here). Last year I did not know what to expect at all. 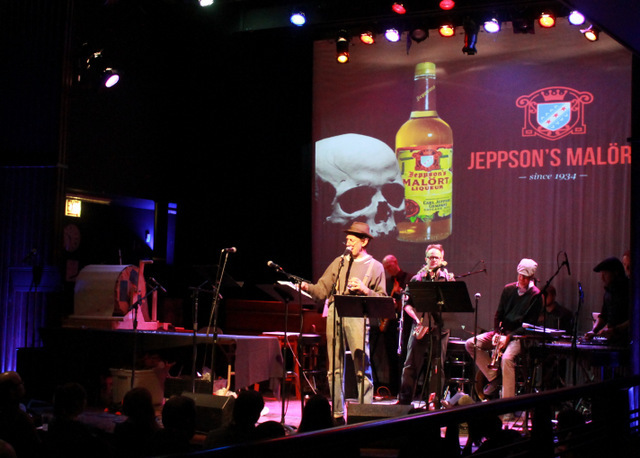 I’ve been to many theater productions around Chicago, but never to radio plays. It was a lot of fun, so I was really looking forward to this year now that I knew how it worked. 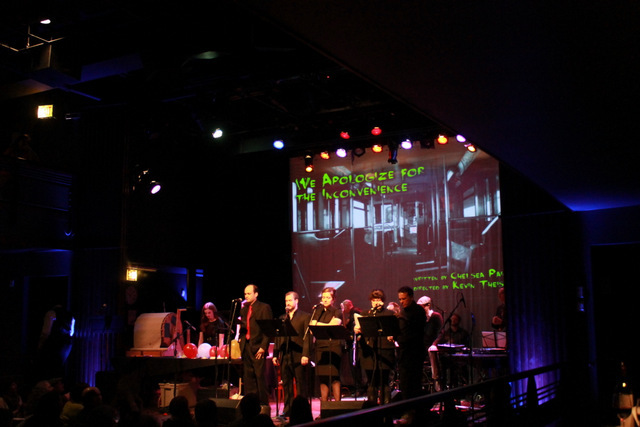 The show took place at Mayne Stage, an event space far north in the city. The set up on the stage had the band to the right side, the Foley artist section on the left, and spaces in front of the band for several actors. I mention the Foley artist section because a big part of these performances is the use of all kinds of special effects to enhance the story. Because they are right on stage they become a bigger part of the performance than just supplying sound effects. 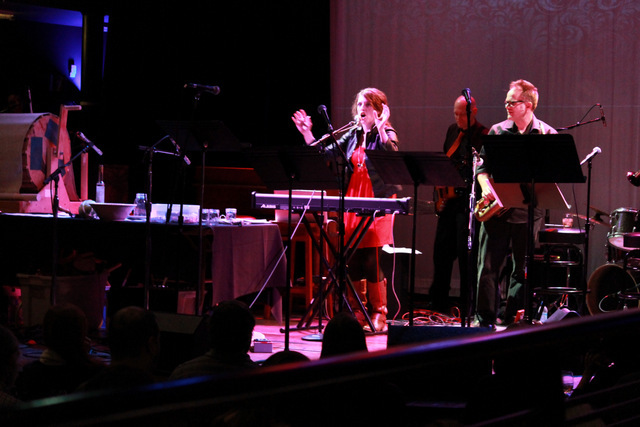 This year the band was Seeking Wonderland, a jazz/rock band that entertained the audience throughout the evening, including musical interludes and accompanying several guest vocalists. I thought the band was ok, but jazz-influenced rock is not my favorite kind of music. The audience overall really enjoyed their performance. Finally, there are the guest judges. Each year the judges pick a winner from the five plays and award a lovely trophy to the winner. The judges were Aaron Carter, Tony Fitzpatrick, Chris Hainsworth, Carolyn Hoerdemann, and Ben Templesmith. 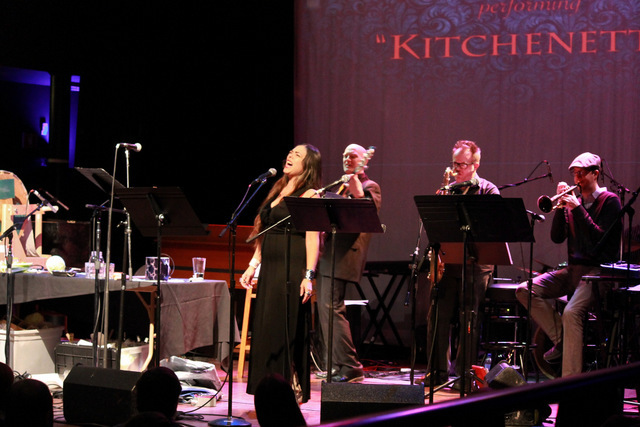 The show started with a song sung by judge Carolyn Hoerdemann called “Kitchenette”. It was a good song, but the band overpowered her vocals. Finally, we get to the meat of the evening. First up was Strange Weather by Travis Williams. 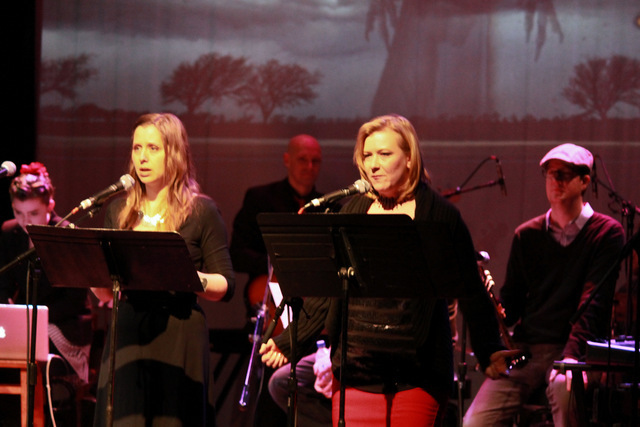 This play features two sisters, Lisa and Becka, who return to a rural homestead. A big storm is approaching while the two women dig through old mementos. They find jars of ink and drawings of crows. Their mom had disappeared 10 years prior among similar conditions. There was always something strange about their mother, and it seems the younger sister, Becka, has similar characteristics. Crows gather outside the house as the storm builds, leading to an exciting ending as Mom and another missing relative return for a tasty meal. The Foley artists got one of the biggest laughs of the night at the end of this show. To illustrate Mom eating her own daughter, they started madly eating celery over a bowl. My Quick Review: This was a good play to open the show. You had to think to keep up with the story, and the ending was wonderfully gruesome. However, I think the story line was a bit complex to cram into 10 minutes, so that lowered it in my rankings. There was a brief interlude for a Four Moon Tavern skit that was very amusing. The second entry was Record/Record by Mark Harrison. In a nutshell, it is a first person narrative of a zombie invasion. Alan Jensen is trapped in his 6th floor apartment. He is making a tape recording for his girlfriend Karen of what he is experiencing. At first he is ok; he has enough supplies to last for a while. As the story continues his situation becomes desperate. In the end Karen has been knocking on his door for 2 days, and he finally lets her in to his doom. His final recording is just him moaning. It was fun to watch the Foley artists during this whole play, as they spent most of their time moaning. My Quick Review: This was my second favorite play of the evening. It was a simple premise, and as he made each recording you could hear and feel the situation become worse. His despair when he finally let his girlfriend in, knowing that it would mean his end, was palpable. Excellent story. 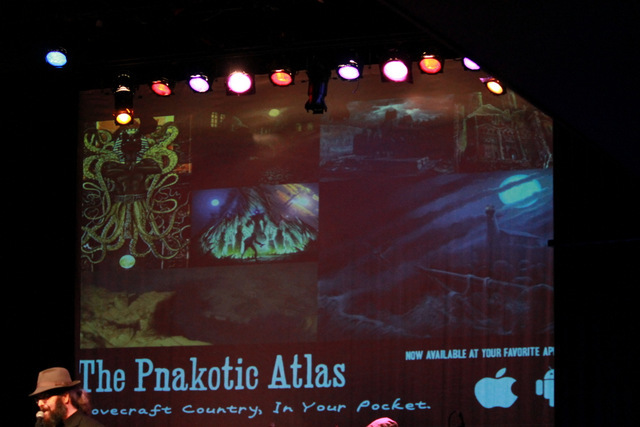 The next ad was for the Pnakotic Atlas – the Lovecraftian Country in your pocket! The big Foley-related laughs here were for vomiting and Trish’s explosion. My Quick Review: My favorite of the night. It was an original story, and the acting was excellent. Having Trish sit under a blanket until the end was very intriguing, as you were wondering the whole time what would we see when the blanket came up. 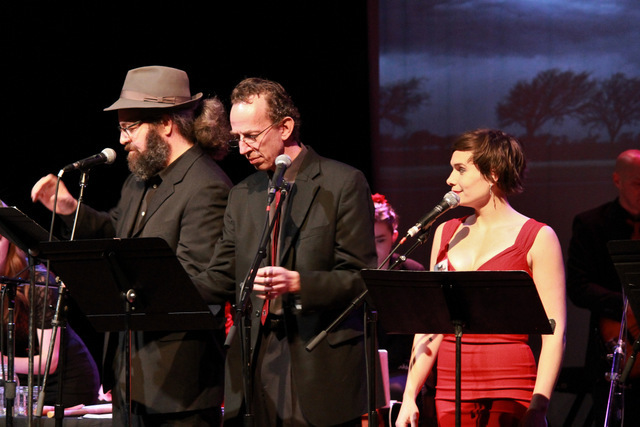 The intermission featured the songs “Don’t Go Into That Barn” sung by Matt Kahler and “Hunting Season” by Mallory Nees. I enjoyed these songs quite a bit. 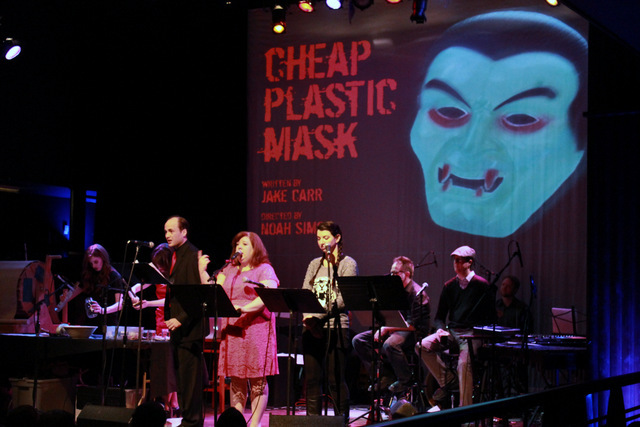 After the intermission the next play was Cheap Plastic Mask by Jake Carr. Emily has been drinking heavily at a house party. She wants someone to talk her through it, so her friend Joel stays to keep her company. Another guest, Rachel, comes to talk about their host Katie who is in her bedroom with a guy in a cheap vampire mask. He was touching a lot of people earlier and Rachel is worried about Katie. After more drunk talk they hear a scream. Joel checks on Katie and thinks she’s dead. Emily calls 911 when they get trapped in the bathroom, but it’s too late. 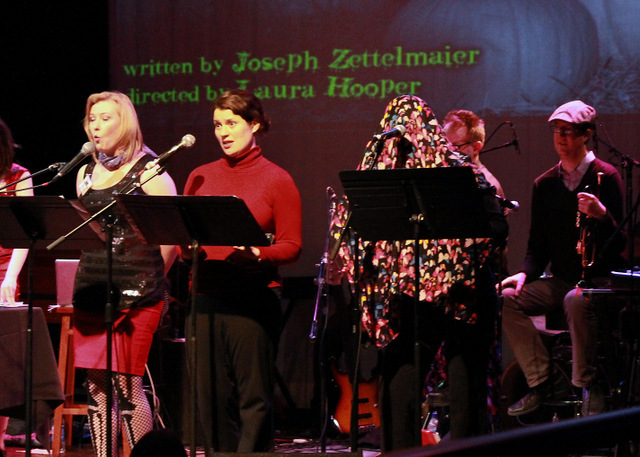 The Foley artists worked overtime with the vomiting sound effects during this play. I ended up having to close my eyes because the sound and the visual were actually getting to me – I’m a sympathetic puker and I didn’t want to spew everywhere! My Quick Review: This was the weakest show of the night. It was barely a horror story. It was just a long, tedious conversation between two drunks until the very end. The final performance was We Apologize for the Inconvenience by Chelsea Paice. Three people are stuck on a subway train that is stopped due to a medical emergency in a train ahead of them. The first man is an older person on his way to get a flu shot, although he fears that the shots make the flu worse. The second man is hung over – or is he sick? The third passenger is a woman. Throughout the play an apology announcement plays over a loudspeaker on the train. The hung over man continues to complain about a headache, and his symptoms get worse until something explodes out of his head. The woman and a subway worker rush out of the train car into the next one. There is a dead woman there, but they can’t contact anyone in authority. The worker locks herself into the driving compartment; as the woman bangs on the window to let her in, the worker’s head explodes. There was a lot of celery used in this one, and the Foley artists popped several balloons for the head explosions. I flinched even harder, I think, when they popped the balloons because you could see them holding the balloons and you knew what was going to happen – the anticipation made it worse! My Quick Review: This was not my favorite, but it was definitely in my top 3. Very interesting premise, and I like stories where you have to imagine what is going on versus just showing it. I liked how it ended, and I think that elevated the story. The final entertainment was a dramatic reading by Steve Herson (my favorite company member of Wildclaw) and another funny ad – although apparently I didn’t take any notes on what it was about! I experience some strong cognitive dissonance when watching horror on stage. People react very differently to horror, and I think that tends to be even more exaggerated when seeing horror live on stage. So many horror movies are played for laughs that I think humor and horror have become too intimately linked. I have found that I rarely laugh when watching plays, yet I’m often surrounded by the laughter of others. At Deathscribe, a huge part of the laughs comes from seeing the Foley artists hard at work right on stage with the actors. Time and again I find my eyes drawn to them because they are doing so many different things. The actors, on the other hand, are usually just standing at the mikes. When two people suddenly start gnawing on celery to simulate cannibalism it’s hard not to laugh…and it breaks the “horror mood” the author is trying to build. I think it prematurely releases that tension. However, I realize Deathscribe is more than just theatre – it’s a party featuring horror stories as only part of the entertainment. It’s carrying on the current trend combining horror and humor (with copious amounts of alcohol!). That being said, I would love to see some of these plays rendered on a real stage without the Foley artists visible – or perhaps in a short film. Maybe even doing them audio only – they are radio plays, after all. Some of the concepts are truly horrifying and could be chilling if not handicapped by the distractions of the sound effects being visible to the viewer. While we waited for the judging, I had Dave number the plays in his order of preference, and I compared them to mine. For Deathscribe 2012 we both had different number one choices, but this year we agreed! The rest of the lineup we judged differently; we could quibble on the rankings forever, I imagine. Our number one play was The Monroe County Pumpkin Queen. It was an original idea, and Sue was such a cold, calculating character that it gave me shivers! One of my other favorite lines of the night was how she said the human deaths were “sacrifices made for science.” It was a simple yet very effective premise. I ranked the rest of the plays this way: Record/Record, We Apologize for the Inconvenience, Strange Weather, and Cheap Plastic Mask. Dave ranked them this way: We Apologize for the Inconvenience, Cheap Plastic Mask, Record/ Record, Strange Weather. The judges came back, and they announced the top three. So Chelsea Paice wins the prize for Deathscribe 2013. Congratulations! I thoroughly enjoyed my evening at Deathscribe. 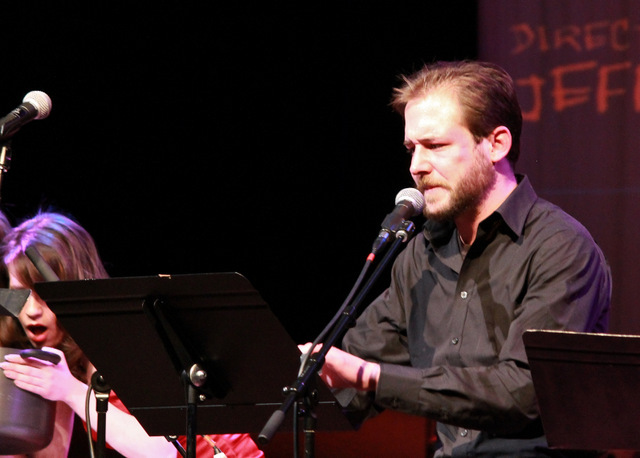 It’s fun to see what playwrights can do when restricted by length and format. I look forward to Deathscribe 2014 with great anticipation. I hope to see you there! Check out Wildclaw Theatre for more information on upcoming shows in 2014. This entry was posted in Horror Theatre and tagged Deathscribe, Review, WILDCLAW THEATRE. Bookmark the permalink.